A way to dramatically reverse the aged look and feel of hair. 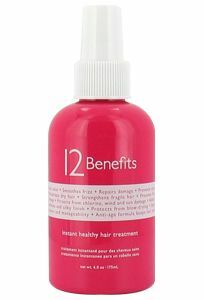 Simply apply after shampooing and conditioner and see the amazing results. It will help to seal in hair color, repair damage will still controlling frizz, can reduce split ends, prevent damage from environmental factors, and also provides thermal protection from blow drying. This spray does all of this and still keeps hair soft, smooth, and keeps that healthy glow seen in youthful hair while adding the strength needed to keep hair in the best shape possible.